Marble, grey-white, coarse-grained. Imperial period. Height: 25.6 cm. Diameter of discus: approx. 26 cm. Budapest, Museum of Fine ArtsInv. No. 50.389. Left hand holding a discus. Fragment of a statue. Height: 25.6 cm. Diameter of discus: approx. 26 cm. unknown; from the legacy of S. Meller (1948); formerly in the Berlin Museum. Missing: the wrist, the back of the hand and the first joints of the figers with part of the discus. The thumb is intact; an iron tenon is to be found in the fracture of the index. The discus, slightly convex, is undecorated. The surface of the back of the hand is worn; the tendons may have been indicated. The muscles of the hand, modelled somewhat summarily, do not seem to be contracted. This way of holding the discus is known primarily from the discobolos of Myron (a comparable fragment is to be found, for example, in: J. Keil, JAÖI 24 (1929 Bb I p.40); the fragment could therefore belong to an exact reproduction of this work (see on a gem: E. Brandt and others, Antike Gemmen in deutschen Sammlungen I.3 (Munich , 1972) no. 2389, p. 48), frequently imitated in a variety of ways (cf. Mind and Body (Athens, 1989) p. 264). 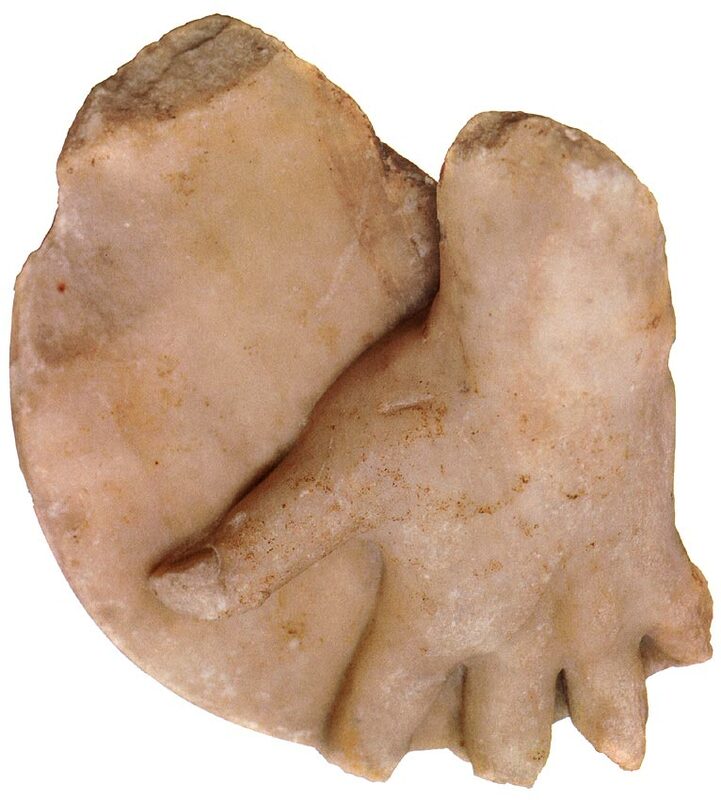 This fragment could also be classified among the copies of the Discophoros by “Naukydes”, see in particular the Frankfurt statue in which the position of the fingers is identical (see Linfert, in: H. Beck and others, Polyklet (Mainz, 1990) pp. 603—605); for the list of replicas: D. Mustilli, Il Museo Mussolini (Rome, 1939) pp. 115—116). As for the Discophoros by Polykleitos, the question of its interpretation remains for the time being fully open (see P.C. Bol, in: Polyklet, pp. 111—117 and E. Berger, Antike Kunstwerke aus der Sammlung Ludwig 3rd (Mainz, 1990) pp. 117—138). Among the bronze statuettes, other types of athletes are also found with which the Budapest fragment can be compared (see for example E. Berger, Kunstwerke der Antike. Sammlung Kapelli (Basle, 1963) no. B 19; P. Arias, SE 22 (1952—1953) pp. 69—77). Mentioned by Z. Grozlan-A. Dobrovits, Antik kiállítás vezetö (Guide to the exhibition of ancient art), (Budapest, 1947) no. XXIX p. 50. Le Sport dans la Grèce antique (Brussels, 1992) no. 166 p. 301. © 1993. Photo, text: Olympism in antiquity. Olympic Museum Lausanne. Bertelsmann UFA. Industria Gráfica S. A. Barcelona, 1993, p. 93 cat. no. 36.